What's the best way to access a 4GB csv file? Specifically, I want only the rows for hospitals; though, one might want the rows for healthcare clearing houses, or home health agencies, etc. The unzipped NPI file is 4.8GB, which is too large for my desktop applications. It is an interesting barrier to open data. As you're only taking a portion of the file, you may be able to use simple tools to subset it before processing. That may get it down to a reasonable size to work with. This lets you extract the lines without uncompressing the larger file on disk. (with today's systems, drive speeds are often a limiting factor, so working with the data compressed can be more efficient if you have sufficient CPU). you can connect to the file with sql and run your analysis from there. You could do the same thing for zip archives with zipfile. If this data is coming from across a network you can pay very little or sometimes get performance improvements by not copying and then uncompressing it. It can cost you less to pull it across the network compressed (smaller) in pieces and operate on it then it does to pull it across in bulk, uncompress it, and then read it. It also doesn't use up local storage resources. There are streaming CSV parsers, that only look at a small window of the file at a time. Load the file into PostgreSQL database table with a Copy statement. This will give you the full capabilities of SQL syntax, plus the ability to index columns for faster access. For complex queries you have a optimizer that a can figure out the fastest way to access the data. PostgreSQL has smarter I/O than most applications it will detect sequential read access and read-ahead to pre-load data into memory. Results can be viewed in Excel or other spreadsheets by accessing the data via an ODBC driver. You can access to PostgreSQL via several Cloud Services like Heroku or AWS. It would be good cloud project to create a new machine instance, install PostgreSQL and copy the data to the instance. Then use the Postgres COPY command to load the data and then access the data with a PostgreSQL client application from your desktop. On Windows, there is also a software called Delimit ("Open data files up to 2 billion rows and 2 million columns large!") http://delimitware.com For instance it can split, sort and extract only some rows or columns. This answer is not really useful for non-programmers, but if could manage some programming in perl, the Parse::CSV module is especially designed for this task. It provides a flexible and light-weight streaming parser for large, extremely large, or arbitrarily large CSV files. Perl is usually very good for data mining tasks. Well, in short, Talend Open Studio for Data Integration is an ETL. It can be used for many use cases, including data migration, files processing, etc. You can easily build jobs using a visual editor to combine specialized connectors (read CSV files, select rows corresponding to your criteria, write result to one or more files or directly to a database, and more). The possibilities are endless because there are more than 800 connectors. At the end, TOS generates a java application which can be launched from the designer or for the command line (Windows or Unix). I am a big fan of tad which crunches these kind of files easily. I have used utilities such as (g)awk to readlarge file such as this record by record. 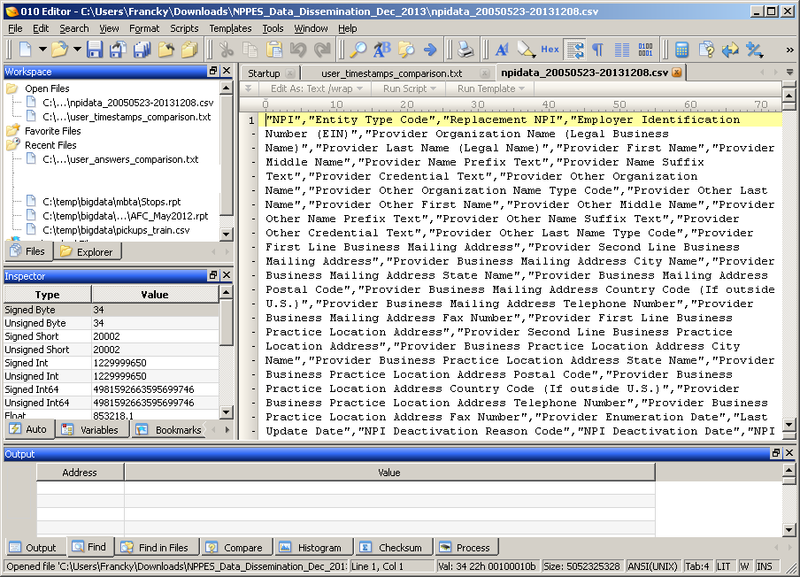 I the extract the required information from each line and write it to an output file. For windows users (g)awk is available in cygwin. I have also used python to achieve the same result. You could implement this process in most programming languages. would work, since it reads the file iteratively, not all at once. If you're on Windows, I can't sing the praises of LogParser high enough. It allows you to query files in a wide variety of formats (mostly log formats as that's what it was meant for, but XML and CSV are valid). You query the file with a surprisingly complete SQL syntax, and you can even use it to import an entire file directly into an SQL database very easily. It's extremely fast, too. I've used it to process 5 GB of IIS log files and a query as complex as SELECT DISTINCT cs-username, cs(User-Agent) FROM .\*.log where cs-username is not null took about 2 minutes to complete running on my laptop. join those output-csv files back into one csv file for further processing. You can then use this file e.g. with SQL databases, Open-/Libre-/MS-Office, Statistical tools etc. Depending on the OS you are using, there are a series of open source tools available to split / join large files or tools already installed. MS Windows: you will have to install a tool or use a script (e.g python) to do the splitting. If you search Google for "splitting csv files" you will find quite a selection. Alternatively you could also use a live CD/USB stick with e.g. Ubuntu on it (see the Ubuntu web site for how to create one) and then use the approach below. Linux / Unix: Use the split command: e.g. split -d -l 10000 source.csv tempfile.part. You can use the join command to join the multiple output files from your selections together into one csv file (either by naming the files and piping them into one file or by joining all files within a folder into one output file - please check the join manual pages or online how to do this in detail). You can try nitroproc. It's currently a beta version I think, but allows to sort/summarize/filter/etc. It's free. I've had good luck in R (without resorting to fancy packages) of reading CSVs up to and beyond that size. The nice thing about getting it in RAM, if you can swing it, is very fast manipulation. If you want to do some processing on a large csv file, the best option is to read the file as chunks, process them one by one, and save the output to disk. If you want to explore the file and you are looking for free tools, you can use Power Query add-in for Excel or glogg log explorer. query the SQLite database directly, or publish a simple HTML form that supports faceted and/or form driven searching / filtering as well as a form that lets you enter and run arbitrary read-only SQL queries, usingdatasette. For example, datasette serve -p 8899 mydatabase.db to serve the datasette browser on localhost port 8899. As an added benefit, the datasette service also provides an API that allows you to run arbitrary SQL queries on the data via a simple URL and retrieve the data as JSON. A query can also be used to export just the data you want as a smaller CSV file (datasette - CSV export). Not the answer you're looking for? Browse other questions tagged tool-request data-format programming csv or ask your own question. How do i import a 2gig csv file into R and be able to work with it on my PC? How might I go about visualising historical temperature CSV data?